I'm so happy I managed to komplet my latest patterns last week. First pattern is of placemats. A basic pattern that can be used for several seasons. I have made models for Autumn, Christmas, spring and summer. 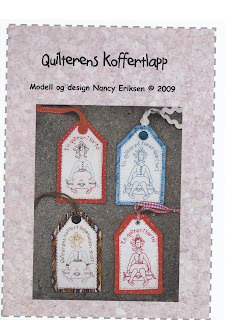 My secon pattern is suitcasetags for a Quilter. I had a lot of fun making this tags. Sorry, only Norwegian text. Lyst til å kjøpe noen av mønstrene mine? Spør i din lokale quiltebutikk eller sjekk nettbutikker. Nå jobber jeg med en BOM og litt jul. Summer is my favorit time of the year. The wether has been really nice lately. No rain at all so the garden have needed extra wather. The other day I went for a walk in my garden with my camera. So many beautifull flowers. The colors are just beatifull. Gives me great inspiration. I love Peonys. This red one have lost its glory allready. It's the first one to bloom in the spring. This soft pink one is in full bloom. I have several variations of pink Peonys. I bought a selection of 6 this sping, but I don't think there will bee any flowers this year. Roses are another garden favorite. Sorry, but I don't remember names on the different kinds. This one have petals like velvet. This is a pale yellow rose with a devine fregrence. But hey, who have gone for a nap in the shadow? Yes, right, Gizmo too likes to relax on the veranda. This is my local TSV-group. We get togheter once a month during daytime to make quilts for TSV. 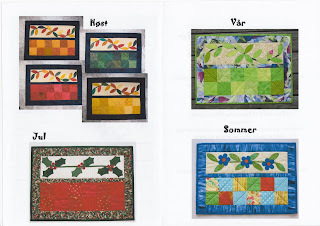 TSV is "Tepper som varmer" (Quilts for kids with canser or long term diseases). A charity I support. On Wednesday I went to Kristiandsand to the hospital. No, no, no. I'm not sick! I went to the childrens ward to deliver quilts from TSV. One of the few times my hospitalvisits are of pleasent character. Thursday I made the same round to the hospitale in Arendal. I also managed to squeeze in a visit to DS1 and some quiltshops on Thursday and Friday. Stops in quiltshops and quiltsupplier made my bankaccount gasping for air!! That's what happens when you buy bolts of supplies. This weekend I need to do some photographing of a quilt that I'll give to another charity, Pink Ribbon (Rosa sløyfeaksjonen) in October. The quilt is to be sold for a donation to the Norwegian Pink Ribbon. The rest of the week I'll be dedicated to making patterns for sale. It takes a lot of work to get to the finished product. I am a kind of newbie and are doing all parts myself. Just a little report to tell you I'm working on new patterns. In between I need something that not demanding for my brain or lims. That is where the log cabin blocks come in handy. I have made some more blocks for the quilt I started early May. I layed all the blocks out and look what happende! That cat! Making a mess of all my neetly layed out blocks! Clearly Gizmo want some attention! Before Gizmo stepped into the picture I figured that I need 23 more blocks to make a suitable size lapquilt. I'll make those blocks in my next "clear my brain" brake from models and patternmaking. I'm long due my bedtime. Not very smart since I have invited guests for lunsj tomorrow. What did I buy in Gotenborg?? I got a phonecall from a friend today. She missed my blogging :-) Well, she was wondering if I was OK since it have been almost two weeks since my last post. She know I have something to blog from Gotenborg. So, what did I buy?? Are you waiting to have a peek too?? I bought a bag of pink buttons, a tapemesure in a little tin, embroydey needles, pins, magnetic buttons for bags, refill for my stitchery markingpen, some Japanics fabrics, a nice cellection of DMC linnen embroidery floss. Never seen this DMC floss before. Really nice earth tones. I also bought a bended embroidery scissor for machine embroidery. Found three stuffing tools for dollmaking that I have been looking for a long time. A roll with seven diffrent silk threads for applique was something I never knew I needed. A big spool for bastingthread I knew I needed. 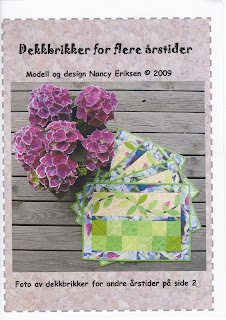 I subsribe to this swedish quilt magazine calles Fat Quarter. Latest issue had a nice tablerunner with bees on. I bought a kit for this tablerunner. Have not started this project yet. Last week I finnished up a project for a magazine. That was my only project in May. It's on my list, but no photo. Truth, I forgot to take photo before sending it of. I was in such a hurry to get it packed end sent off that I simply forgot. Past weekend was a long weekend here in Norway. Monday off too. The weekend was a summer delight. Nice sunny wether and temperature. I have spent entire day outdoor, working a bit in the garden, stitching, grooming the cat and just relaxed. Do I look like a cooked shrimp?? No, not at all :-) According to earlier experience I went heavy on the sun screen lotion. DH have been cooking, as he always does in weekends. Mostly barbecue due to nice wether conditions. This weekend really filled my batteries again. My spirit is high and tomorrow I'm back in my sewingroom. Thursday May 21th Sissel picked me and my mom up to go to NQT in Gotenborg, Sweden by car. Sissel is an excelent driver :-) We had some exciting, exchausting and wonderfull days in Gotenborg. Several blogs have posted photos from exhibitions and other events. May Britt have a nice collection of photos on her blog. Look at posts from May 22nd to 27th. Since I'm so late with my blogging I don't bother to post any photos from shops and exhibitions. A photo from the Quilt dinner on Saturday evening. Here is my mom chatting with new and old quiltingbuddies. May 19th - 20th Gerd Gellein Merkesdal visited Grimstad. Merete, the local quiltshop owner invited some people to her family's summerhouse. It was quit windy but we enjoyd fresh seefood overlooking the sea and the sunset. Merete is the fair lady in the middle. Gerd is the dark haired lady to the right . The next day she held a show and tell from her new book: Patchwork in red and white. Gerd have written 10 books about patchwork, some of them as a co-authour. I don't know if any of them is translated to English. Ofcause this show and tell was held in Meretes shop. Very nice evening.